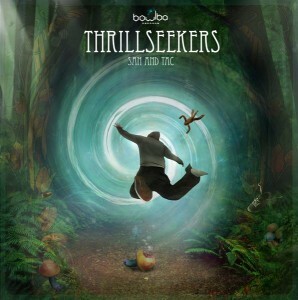 Bowlba Records presents ThrillSeekers, a new release by the wildly imaginative San and Tac. The result of multiple psychedelic experiences on the east cost of Australia, this release is a surprising blend of chunky forest grooves and uplifting full-on psytrance. Expect melodic, driving, and thought-provoking music to move the dance floor. MP3 Download | FLAC Download | WAV Download · Download count: 7,583.
i Really Liked Track 1. Nice ideas, beat is good, but i little bit too dry!! More chorus for the fx please. Great album! love San and Tac music, very mischievous and psychedelic, with subtle melodic moments. Keep keeping, and thanks for the free release! Also catch Them live in Europ/Germany in Summer 2014. “JackMushroom” is a helluva track! The other two tracks are pretty good but that first track gets better and better with each listen. new ep is here on ektoplazm!!! and “JackMushroom” is up for remix since 2016 on our facebook too!